Inspired by the Bourke Street Bakery’s Spiced Fruit recipe posted on this page: http://youcandoitathome.blogspot.com/2011/06/bourke-street-bakerys-spiced-fruit.html. I have baked this before but course, I have to change things up a bit by subbing out some of the raisins for cranberries and soaking the dried fruit in tea. I am also using a mixer now rather than slap and folds. Extra flour to feed the levain. Take 16 g of your refrigerated starter and feed it 16 g each of left over bran and filtered water. Let rise overnight. Feed the levain 32 g of bran/extra flour and 32 g of filtered water. I had some locally milled flour hanging around that needed to be used up so I utilized that. Mix the unbleached flour, the high extraction flour, and the ground flax well in a tub, cover and reserve. Make a strong cup of tea using the herbal tea and some water. Measure out the cranberries and the golden raisins and place in a bowl. To the bowl, add the yogurt, 50 g of tea, and mix well. On top of this mix, add the cinnamon, and the mixed spice. Do not mix in! Cover and place in the fridge till the next morning. Before going to bed, feed the levain 64 g of water and 64 g of unbleached flour. Feed the levain 128 g each of flour and water. Let rise in a warm spot till double. This should take about 4 hours. Take the cranberry/raisin mixture out of the fridge to bring to room temp. Two hours before the levain is ready, mix the flours and the water in a stand mixer to a shaggy dough with no dry spots. Autolyse for 2 hours. Once the Levain is ready, add the levain and the salt to the mixing bowl. Mix on speed 1 for 2 minutes. Add the fruit mixture and mix on speed 2 for 5 minutes. Let rest for a half hour in a warm spot. On 30 minute intervals, do 4 sets of stretches and folds in the tub. Let rest an hour and a half, and then retard the bulk for two and a half hours. The dough rose about 25%. Tip the dough out on a bare counter, sprinkle the top with flour and divide into portions of ~830 g. Round out the portions into rounds with a dough scraper and let rest one hour on the counter. Sprinkle rice flour in the bannetons. Place the dough seam side down in the bannetons, cover, let rest for a few minutes on the counter and then put to bed in a cold (38F) fridge for 9-10 hours. I am pleased with the oven spring considering the amount of fruit in these. Hopefully the crumb isn’t too closed. Danni, These are just lovely and sound delectable. All your loaves have your signature on them. I can tell a Danni loaf just from the jpeg of on loaf. on the soaking and the tea? Not sure it had any effect. 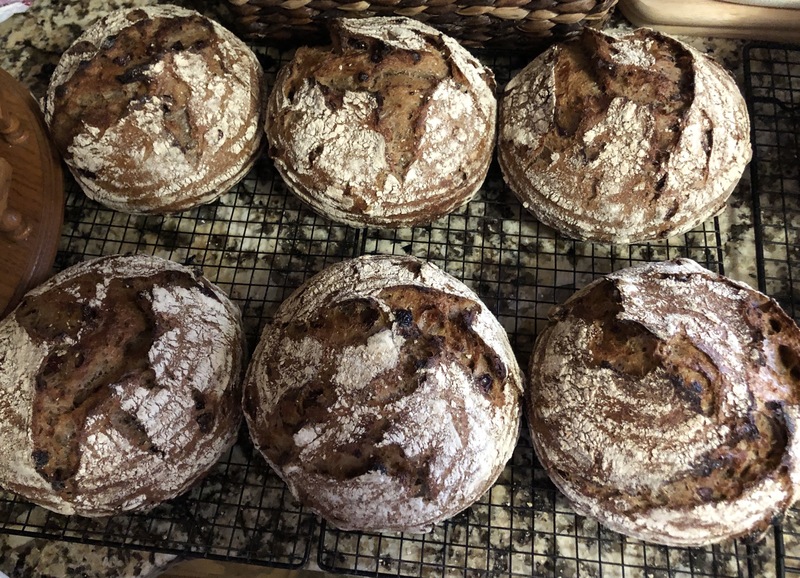 I just pulled these out of the oven so I haven’t cut into them yet, but the few raisins and cranberries that fell off the loaf while shaping them, didn’t seem to have a lot of the nutty flavour from the tea. I did think of using more tea as dough water but chickened out at the last minute.